The sad day has come for Triple Crown and Snowden Racing to retire seven-year-old gelding Hot Snitzel, following the discovery of the early stages of a tear in his near-fore suspensory ligament. Hot Snitzel has been a tough, consistent and extremely successful racehorse for his connections who have earned $1,334,850 in prizemoney and bonuses throughout his racing career, one which spanned over five years and saw him compete in 38 races (all at Group or Listed level other than his debut and his next run in the Inglis Nursery) for eight wins, six seconds and three thirds. Kicking off his racing career with a 2.5 length win as an early two-year-old at Rosehill Gardens, Hot Snitzel progressed to almost dead-heat the Group 3 Skyline Stakes when finishing second earning himself a run in Sepoy’s Group 1 Golden Slipper before placing third in the Group 3 Kindergarten Stakes. 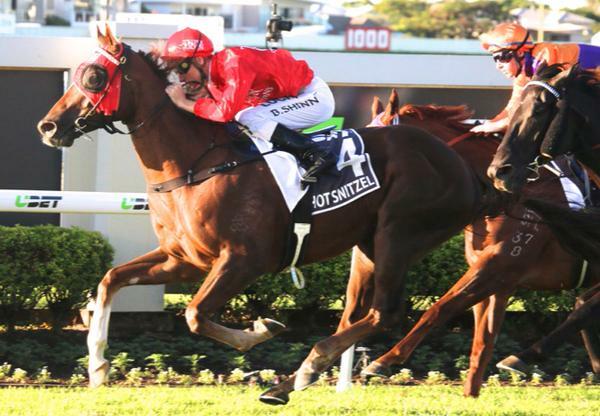 Returning in the winter for a Brisbane Carnival campaign, Hot Snitzel managed to win both the Listed Ken Russell Memorial (by 6.5 lengths) and Group 2 Sires Produce Stakes (by 3 lengths) before running a close second in the Group 1 T.J Smith from barrier 10 of 11. As a three-year-old, Hot Snitzel won the Listed Brian Crowley Stakes and Group 2 Royal Sovereign Stakes, defeating Group 1 winners Manawanui and Moment of Change, as well as running a close up sixth behind Sepoy and Foxwedge in the Group 1 Coolmore Classic. At four, Hot Snitzel continued delivering the goods with a win in the Group 3 Sebring Stakes (defeating Group 1 winner Smokin’ Joey) and at five, he ran second in the same race before winning the Group 3 Hallmark Stakes. At six, Hot Snitzel delivered his first Group 1 in what was certainly a career highlight when storming home to win the Group 1 BTC Cup with Blake Shinn in the saddle. His final start for his connections was as a seven-year-old in the Group 2 Linlithgow Stakes down the Flemington Straight over the most recent Flemington Spring Carnival. He ran a gallant second behind Eclaire Choice, just ahead of Triple Crown stablemate Dothraki in third, making it an extra special result for the team. Hot Snitzel was a $60,000 purchase from Bellerive Stud’s 2010 Inglis Melbourne Premier Yearling Sale draft of yearlings. He is one of Snitzel’s best performing progeny and the ninth, final and best performed live foal from US mare Flames Of Paris.